The final episode of Counterpart ended on a memorable note and it's a shame to say goodbye to this near-perfect series, having reviewed every episode since the pilot. It's been a sad goodbye as the series hit all the notes to work as a proper finale, but at the same time, the possibility of spending more time in this world remains all the more exciting and the prospect of a Counterpart 3.0 is too much to turn down. Hopefully Amazon or Netflix, or even Hulu, could pick up this series for another season as it truly deserved the world, and with more promotion it would easily be in the contention for Emmys. It's that good. With things coming finally to a melting point, Mira put her plan into action and Indigo headed to the train station where the virus was going to be unleashed. Doing her best to stop her, Emily Alpha and Nadia assembled a team to head to the Earth Alpha version of the orphanage where the Indigo footsoldiers were raised and Emily Alpha came to terms with who she was as a person. It was a heartbreaking, emotional moment that she shared with Ethel before she chose to step on the trip wire that whilst it showed that Emily was willing to change and become better, that wasn't the case initially for Howard, with the impact being felt from his time spent in the Prime world, and after having been ground down by Yanek he has accepted that there is no escaping the same fate as his other. The two realised that things couldn't go back to how they were before, no matter how much Emily Alpha was willing to try. And then Emily died. It was such a terrific performance from Olivia Williams, who deserved a memorable send-off for her character and this was it. Williams' performance in episode 9 was good, but this was even better. Counterpart may have started off as a J.K. Simmons vehicle but one thing that Season 2 has been very good at is showing just how well it can work as an ensemble. Emily Alpha's arc may have ended in tragedy, but it was a good send-off proving to everyone in the series that you don't always have to be the same person as your other. You can be a better person if you put the effort and work in, and the same is true for real life as much as it is in the series. Better Angels pushed Howard Alpha to a breaking point as his arc ultimately came to a conclusion by the end when he came face to face with his other, who he found out had been lying to his wife and sharing their house and his life. It was an emotional conclusion coming just after we learnt that Emily Alpha was really dead, and there was a point where I almost thought that Howard Alpha might pull the trigger. But his better instincts prevailed, and let Howard Prime live. And then Mira and her loyalists were dispatched just as quickly as Mira dispatched Management, in a cold and brutal fashion by Howard Prime. In the end, he did what he did best, and for his efforts, earned a way back to his own world bringing Baldwin back in the process. One of the biggest disappointments of Season 2 for me and something that I was hoping to be rectified in Season 3 was how little Baldwin was used, but she instantly made an impression anytime she was on screen. Their return to Earth Prime opened up a whole world of possibilities and that shot of them in the tunnel was a good send-off given what time the show had left to spend with both characters. I was happy that both Clare and Peter were able to survive after the worrying foreshadowing of In From the Cold's episode title. Their relationship again shows how Clare has reformed and changed over the course of the series and that confrontation between Peter and Spencer, the latter of whom abandoned on Earth Alpha with nobody coming to rescue him from his Earth, no friends at all, was satisfying especially when Peter revealed that Clare was responsible for Peter getting his job back at the end rather than his Clare's father. The new status quo at management in a world where the border crossing is shut presented an interesting dynamic, but yet another that we'll never get to see unfold, especially with Nadia still around. It's worth mentioning that Nadia is one of my favourite new characters of 2019 and I love how seamlessly she was introduced to the series like she's been a part of this world all along. The final twist, no doubt engineered with a third season in mind, that Yanek was part of a secret virus unleashed by Mira was something that could have potentially been cut out to tie up loose ends assuming the series does not get picked up by another network but it was nonetheless an emotional conclusion for someone who like Nadia who has been a very key player in Season Two. It leaves it open for Season 3 but at the same time, it almost weakens the closed off-storylines that the finale did an excellent job in wrapping up. I was kind of let down in the fact that we never got to see more of Peter Prime, nor for that matter meet Nadia's alternate self, but given the time that the show had left, I love that the writers were able to wrap things up and give audiences a satisfying ending so that if we never were to get anymore seasons, it would work on its own as two masterfully crafted episodes of television. The more optimistic viewpoint for humanity was refreshing especially in the age of grimdark anti-heroes and the two Howards were a fascinating character study of how choices can change a person's life. Howard Alpha ends up walking away from the agency, alone in his own world, whilst Emily Prime was able to get revenge on Mira upon her return to her world. However the optimistic nature did not extend everywhere, with the closure of the gap between the two worlds signifying the end of the experiment and technically giving Yanek and Mira what they wanted after all even if Mira didn't get to see her Plan A carried out. No doubt this would have been rectified had the show continued especially as it was established that the two diplomats got on well with each other and are going to miss their time spent together. 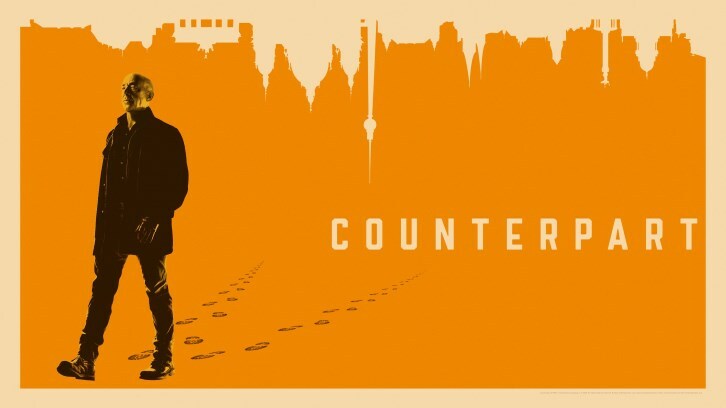 But all good things must come to an end, and we too, are going to miss Counterpart. There are few shows that have been as creative as this one has been.